This manual provides a procedure for “tracking” mammals according to tracks left in the snow. Focus is on the behavior of mammals: size of their habitat, biotopic and habitat distribution, feeding sites, behavior during feeding, etc. Several methods of determining track freshness, the direction of movement and rules for tracking are described. Snow cover, which replaces autumn's leaves and mud, provides zoologists with an opportunity to delve into undercover details of animal life, especially mammals, including the most careful and reserved ones. Any beast, regardless of its size, leaves tracks on the snow surface, in other words “an autograph” on loose snow, especially newly fallen snow. An observer who has certain pathfinder’s skills (which can and should be mastered over time,) learns what animals the tracks belong to and under what conditions they have been left. If one follows the whole route (track route) of an animal, recording carefully all evidence impressed on snow, then it is possible to precisely describe all features of animal life in quantitative indicators at the given section of the route. The given lesson involves independent students' work in “tracking” animals that inhabit the vicinities of the school or a field study center, which leave tracks on the snow. They are mainly mammals characterized as active in winter. They include hoofed animals: elk, deer, wild boars, roe deer; Lagmorpha: brown hare and Alpine hare; rodents: squirrels, muskrats, beavers, Carnivore: wolves, foxes, raccoons, lynx; martens, minks, polecats, ermine, weasels, otters and wolverines. The task involves tracking several (different) individuals belonging to one or several animal species out of the mammals found in the given area. A map of the area where tracking will take place is required (a large-scale map is preferable), as well as rulers, compasses and field notebooks. 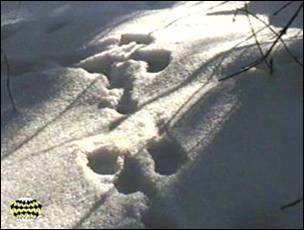 The tracking procedure generally consists of the following: an observer goes along a chain of animal footprints “to the toes” (in the same direction as the animal) or “to the heel" (against the animal movement); the observer is not allowed to cut off any loops or turnings made by an animal, as hunters usually do. The distance covered is counted in steps, whereas the direction of each turn is measured according to the compass. All the data is recorded in the field notebook or plotted on the available plan of the site. At the same time, students should register all of the important features of the animal’s behavior. Preliminary excursions, study of literature, photos and drawings of animal tracks and practical training aimed at familiarization with tracks of major animal species in the given area will help students to master practical skills of track determination. Data on relative numbers of different animal species and skills in track determination that have been gained in the previous lesson will make selecting the object of study much easier. The given educational task involves dealing not only with tracks in their classical representation, i.e. footprints of paws, but with other traces of vital animal functions left on snow as well. Trails of movement – footprints of paws or other parts of a body (a tail, a belly), broken shrubs, compacted paths, littering caused by animal's movement through branches and thickets. Traces of feeding activity – food debris and food reserves, digging in snow, traces of a search for food, feeding tables, bitten and broken plants, traces of chasing and dragging of prey, etc. Tracks associated with shelter-making – burrows, lairs, lies, passages under the snow, etc. Traces of life functions – excrement, urinary spills, traces of molting and hair shedding. Information tracks – traces of information-passing which indicate occupancy of the area – bite marks and scratches on trees and on the ground, discharge of musky glands, sound signals.